3005 integrated circuit rf amplifier. 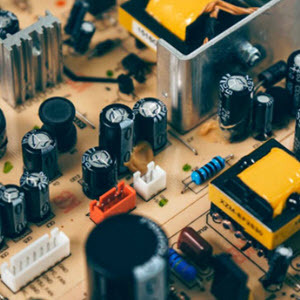 Another performance advantage is the AGC capability of these integrated circuit devices as compared to a single transistor. The application of an AGC voltage to Q2 has negligible effect on the operation of Ql, hence, the input characteristics of Ql remain constant. Ihus, there is no detuning of the tuned input circuit with changes in the AGC voltage. 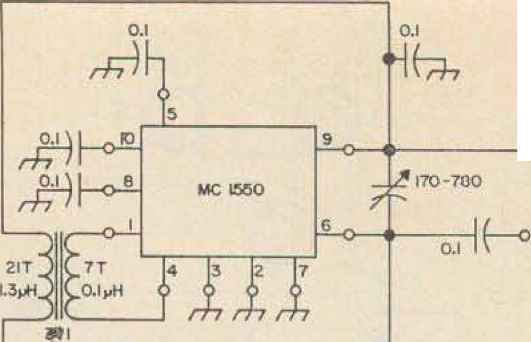 Both the RCA and Motorola circuits can be operated as a differential amplifier with minor external modifications in the wiring. Some of the options of using the cascode configuration or the differential configuration will be covered later. Fig- 2. Schematic diagram And photograph of the Motorola MC 1550, Terminal numbers refer to leads on TO-5 type package. 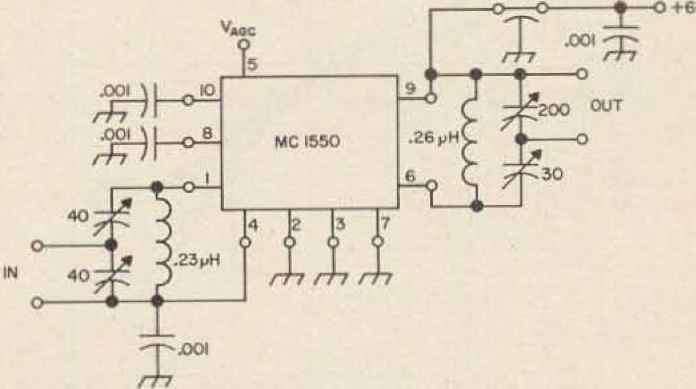 A diagram of the die for the Motorola MC 1550 is shown in Fig. 2. The tiny sill-con chip contains the three transistors, four resistors and the diode. 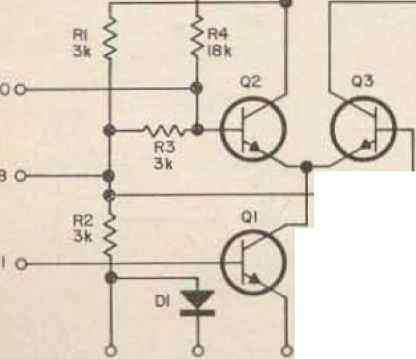 Resistors Ri and R 2 bias Di, and also provide a base voltage for Q3. The other resistors Rn and R( broaden the AGC voltage range from the previously mentioned 114 mV to about 0.86 volts to reduce susceptibility to noise interference.